Hi, I’m Megan from Pink to Green. I’m so excited to be guest blogging for Sarah today; Walking Around is one of my favorite daily stops for inspiring tidbits! Since Sarah’s blog is dedicated to the things she loves from fashion to food and all that’s in between, I thought I’d share with you something that just landed at the top of my love-list for the holidays. Art, fashion and interiors often share a blurred line. For someone who adores all three, partnerships between these fields often yield lust-worthy results. A perfect example is the premier of Kate Spade’s 2010 calendar in collaboration with Brooklyn artist, Bella Foster. I adore Bella’s work. 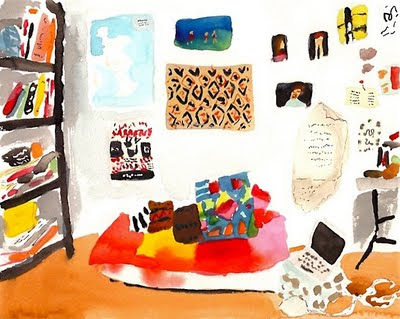 The freeform brushstrokes and color saturated interiors of her repertoire evoke a spirited quality that reminds me of one of my all-time favorites, Raoul Dufy. 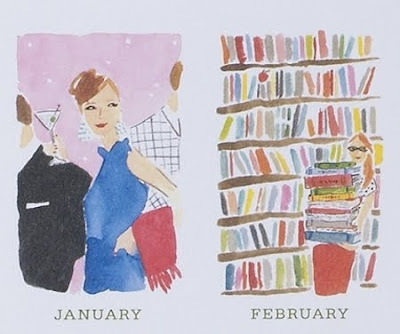 Her paintings for Kate Spade’s calendar convey a similar aesthetic while also capturing the essence of the chic eponymous brand. Just in time for the holidays, this inexpensive gift would be a welcomed way to ring in the New Year. Twelve months of Bella’s paintings would certainly be something to look forward to! Thanks again, Sarah, for having me! I hope you'll check Pink to Green for chic gift guides during the holiday season! Hi Meg, great job! Bella Fosters work is so fun and elegant. We will definitely check out your gift giving guides for the holiday. That would be an awesome calendar to look at - so fun! Will definitely stop by your blog for your gift giving guides..thanks! Thanks so much for inviting me to guest blog- it was so fun! Hope you had a wonderful trip! !